The evening, held at Ottawa City Hall, started off with snacks, drinks and several tables with information about different events and organizations within the Ottawa Region. The packed room felt more like a convivial wine and cheese than an environmental conference. While there were quite a few grey heads in the audience, there was a fair sprinkling of every demographic group. Finally, the event kicked off with introductions by Graham Saul, Executive Director for Ecology Ottawa and a short word from the panelists: Andrea Reimer, Deputy Mayor of the City of Vancouver, and City of Ottawa Councillor David Chernushenko, who is also Chair of the City’s Environment Committee. Missing from the roster was Jody Williams, Nobel Peace Prize Laureate and environmental and social justice advocate, who did send an apology for not being there, citing personal reasons. Andrea Reimer, who is also a City Councillor for the City of Vancouver, gave a very interesting, very passionate description of the Greenest City Action Plan that she and her City Council were pursuing, along with examples of short, medium, and long-term elements of the plan. What was striking about this particular plan is that, like any solid environmental planning, it takes into account more than just pollution: elements of social housing, community projects, political actions as well as Green projects are all de mise. Among the many challenges of planning such an all-encompassing strategy was the impossibility of waiting until planning was complete to start acting. Reimer described that, before their Action Plan was even finished, City Council had already put in place 84 initiatives. Among these, she mentioned composting and food scrap bins, separated bike lanes, public drinking fountains, a deconstruction bylaw that ensuring reuse of materials when a building is taken down. Many initiatives seemed to strike a chord with the attendees, such as urban waste heart recuperation, tree planting quotas, the combination of five different car sharing programs. An essential part of planning for any City, Reimer reminded us, is the partnership. Working with, instead of dictating to inhabitants what they should be doing. Reminiscing about the first public consultations they held for their plan, she remembers being surprised at the amount of people that were interested, and committed to, finding green solutions to problems Vancouver was facing. Reimer pointed out that, oftentimes, starting green initiatives at a national or provincial level was hard; she used the analogy of 100 smokers in a room unanimously agreeing that they should cut smoking within the room by 80%… So who gets to keep smoking? There was a touching moment as Reimer reminded us of all the displaced people all over the world who had been affected by the impacts of climate change. Putting everything she said into perspective, it’s simply that our local actions end up being part of a greater whole. “Green is good for business. Liquid tar is not good for business.”- Andrea Reimer, speaking about the dangers of oil spills on the West Coast. 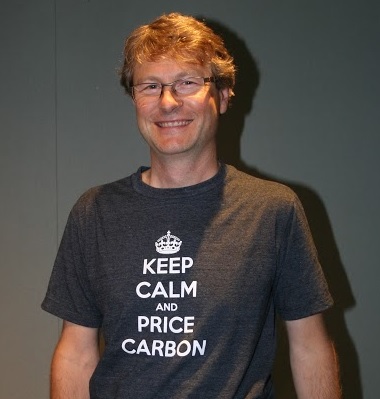 Next, David Chernushenko, City Councillor for Capital Ward, took up the microphone, all the while sporting a “Keep Calm and Charge Carbon” T-shirt. He points out that we have the technological and economic means of making change happen; we just need the will. The Ottawa councillor went on to detail that one of his favorite things to discuss is energy: it touches everything, every part of society. Chernushenko applauded the efforts made by the City of Vancouver and its inhabitants, and the example they set to the rest of us; whether it be in Canada or anywhere in the world. Discussing the upcoming LRT project, he underlined the need to fully integrate transit options: a true “multimodal” system. Chernushenko also touched on the concept of “complete streets” that would be made and used by everyone, regardless of their chosen mode of transportation. While Ottawa and Vancouver are different cities, with different realities, climates and populations, we can easily learn lessons from what has and hasn’t worked for them, and apply this knowledge to residents of the Ottawa Valley. One thing that was easy to notice is that these were no sentimentalists, keen on stopping big oil with peace and love: they were fundamentally convinced of the fact that environmentalism can be viable, a part of a financially sound and sensible development plan for society. The importance of the role of municipal politics in immediate and direct actions is not to be underestimated: we have the technology, the capacity, the budget. We just need the political will and leadership; people and projects will follow. The evening’s thoughts and ideas left everyone in the room a little more optimistic about the future. You can see video of the evening’s presentations here.